Cumberland Point Preform From Dickson Co., Kentucky. 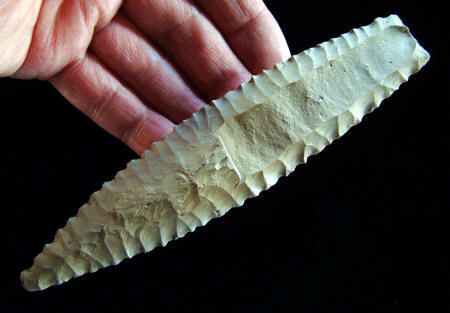 This is one of the best examples of a Cumberland point preform found to date. It’s large size, the fact that it’s a late stage preform and that it broke during fluting makes it a valuable study piece. This point was found in two pieces in Dickson County, Tennessee. It was broken during the first attempt to remove a flute flake. The channel flake was struck or pressured off a prepared platform located at the center of the base. The fluted side was also skillfully prepared, prior to fluting, with uniform pressure flaking. The opposite side has not yet received its final reduction series of pressure flaking that would have removed most of the still visible percussion flaking. Another point of interest is the break pattern caused from fluting. This Cumberland point preform did not break right at the hinge point of the flute but an inch farther down. The study of these types of break patterns in Cumberland points may eventually determine how these long flutes were removed from their platforms, either by percussion or pressure. 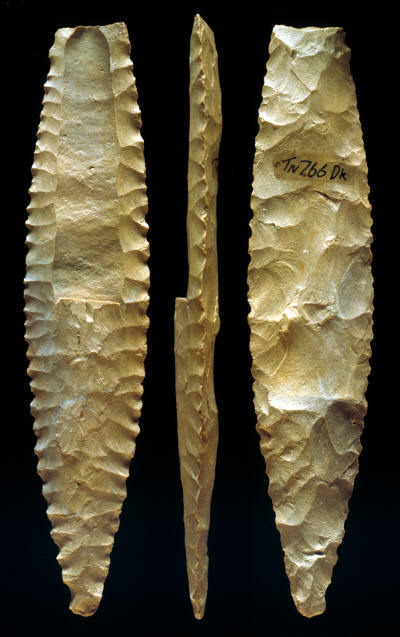 This Cumberland point preform is made of Fort Payne chert and measures 6 1/4 inches (15.8 cm) long, 1 3/8 inches (3.5 cm) wide and 7/16 inch (11 mm) thick. This picture shows both sides and an edge view of the original artifact. The fluted side on the left shows very nicely done pressure flaking and in contrast, the opposite side has an earlier stage percussion flaked pattern. The edge view shows the large channel flake scar, which measures 2 7/8 inches long.